“The general business activity index plummeted 23 points to -5.1, hitting its lowest level since mid-2016,” the Federal Reserve Bank of Dallas said in its latest Texas Manufacturing Outlook Survey. The production index, a key measure of state manufacturing conditions, inched down one point to 7.3. The capacity utilization index fell from 9.4 to 7.6, and the shipments index dipped to 6.1. Meanwhile, the new orders index moved up five points to 14.4, and the growth rate of new orders index edged up to 5.8. The employment index retreated five points to 11.0, a level still above average. Twenty-two percent of firms noted net hiring, compared with 11 percent noting net layoffs. The hours worked index held steady at 5.0. GBP/USD surges to 1.2800 handle, tests 50-DMA for the first time since mid-Nov.
• Persistent USD selling bias helps gain strong positive traction on Monday. • The GBP bulls seemed rather unaffected by uncertainties surrounding Brexit. The GBP/USD pair extended its goodish intraday up-move and jumped to the 1.2800 handle, now testing 50-day SMA for the first time since mid-Nov. The pair built on last week’s rebound from the vicinity of the 1.2600 round figure mark and continued gaining positive traction for the third consecutive session amid persistent US Dollar selling bias. Expectations of a dovish Fed next year, along with a partial US government shutdown kept the USD bulls on the defensive and turned out to be one of the key factors driving the pair higher. Adding to this, possibilities of some short-term trading stops being triggered on a move beyond last week’s swing high, around the 1.2735-40 region, further collaborated towards accelerating the up-move. 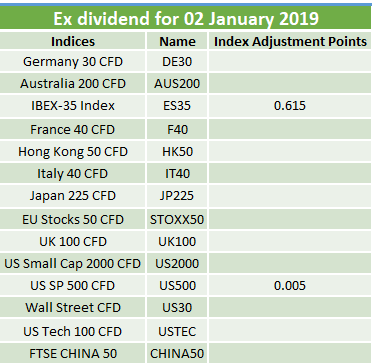 Meanwhile, bulls seemed rather unaffected by Brexit uncertainties, with the broad-based USD weakness acting an exclusive driver of the pair’s strong positive momentum amid relatively thin liquidity conditions on New Year’s Eve. With the latest comments from the U.S. President Donald Trump boosting the risk sentiment, major equity indexes in the U.S. started the day in the positive territory. As of writing, the S&P 500 was up 0.7%, the Dow Jones Industrial and the Nasdaq Composite were adding 0.4% and 0.9%, respectively. Out of the 11 major S&P 500 sectors, only the defensive Utilities and the Real Estate sectors are in the negative territory while the Consumer Discretionary and the Health Care indexes are both gaining more than 1%. The trade-sensitive Industrials index was last seen up 0.87% on the day. US Dollar Index finds support ahead of 96. WTI posts modest recovery gains on Monday. Trading volume is likely to continue to thin out in the NA session. The USD/CAD pair is trading in a 40-pip range on Monday as markets stay calm ahead of the New Year holiday. As of writing, the pair was virtually unchanged on the day at 1.3640. The US Dollar Index, which spent the second half of the previous week under pressure, struggled to make a meaningful recovery on Monday and extended its slide toward the critical 96 mark. However, the index didn’t have a difficult time limiting its losses amid a lack of fundamental drivers that could force the greenback to weaken further. At the moment, the DXY is down 0.15% on the day at 96.25. On the other hand, crude oil moves sideways today and doesn’t provide a directional clue to the commodity-sensitive loonie. As of writing, the barrel of West Texas Intermediate was fluctuating above the $45 mark, adding less than $1 on the day. WTI tries to take back Friday’s losses. Remains on track to close the third week in a row with losses. Following the recovery witnessed in the second half of the previous week, the barrel of West Texas Intermediate lost only around 40 cents for the week and started the last day of 2018 in a relatively calm manner. After moving sideways in a tight range a little above the $45 mark, the WTI gained traction in the last hours and rose above $46. As of writing, WTI was trading at $46.05, adding nearly 2% on the day. Despite this recovery, however, the bearish picture for crude oil remains intact as today’s move is seen as a technical correction fueled by the year-end flows rather than new fundamental developments that could ease concerns over the potential negative impact of dismal demand outlook and record production levels on the oil market. Later this week, on Thursday and Friday, investors will be paying close attention to weekly API and EIA stock reports. US Dollar Index extends decline toward 96 on Monday. Trading action is likely to remain subdued ahead of the New Year holiday. After slumping to its lowest level since late September at 0.9790 last Friday, the pair staged a modest recovery and finished the week at 0.9840. With thin trading conditions not allowing for decisive movements in the last day of the year, the pair is moving sideways in a very tight range and was last seen virtually unchanged on the day at 0.9842. The only data release from the United States later in the day will be the December Dallas Fed Manufacturing Index, which is unlikely to receive a meaningful reaction from the market participants. Ahead of this data, the US Dollar Index is down 0.2% on the day at 96.20. Although Wall Street will be open for a full day of trading today, the risk perception should stay mixed amid year-end flows and not provide a directional clue to the pair. When markets return to full capacity on Wednesday, the IHS Markit’s December (final) Manufacturing PMI reports will be looked upon for fresh impetus. Elliot Clarke, analysts at Westpac, explains that in the recent FOMC’s short decision statement, changes to the language around the economy were minimal. According to Mazen Issa, senior FX strategist at TD Securities, the key pillars of divergence that supported the USD this year – macro, policy and asset prices – are now on a shaky footing. • The US-China trade optimism-led early uptick turns out to be rather short-lived. • The prevalent USD bearish sentiment prompted some fresh selling at higher levels. The USD/JPY pair kept losing ground through the mid-European trading session and finally broke below the key 110.00 psychological mark for the first time since August 21. The pair failed to capitalize on an early attempted rebound to mid-110.00s, supported by the US President Donald Trump’s positive signals to ease US-China trade tensions, and drifted into negative territory for the third consecutive session. The prevalent US Dollar selling bias, amid expectations of a dovish Fed next year and a partial US government, was seen as one of the key factors behind the pair’s follow-through downfall after last week’s bearish breakthrough the very important 200-day SMA. Meanwhile, possibilities of some technical selling below last week’s swing lows, around the 110.15 region, coupled with relatively thin market liquidity conditions further collaborated towards aggravating the selling pressure since the early European session. It would now be interesting to see if the pair is able to find any buying interest at lower levels or the current downfall marks a fresh bearish breakdown amid absent relevant market moving economic releases on the Near Year’s Eve.